There’s as much variety in farmers as there is in the food they grow and the farms they tend. From cattle ranchers to orchardists, aquaponicists to dirt farmers, they are crusty old vets and sparkling newbies… The key is that they practise the methods of organic, sustainable agriculture right here in the Bay Area. Farmers who value the environment, the sanctity of life, who farm organically are the farmers we know best and trust most. These are the farmers who are practising and passing on the lessons of sustainable agriculture. We know, since they are the farmers who taught us how to farm. From beekeepers to kombucha brewers, these are the farmers and producers who make the food for Community Supported Agriculture San Francisco. Get to know these Bay Area originals as well as we have and you’ll begin to have a much deeper respect and knowledge of where your food comes from and the skill, determination and effort it takes to make it. 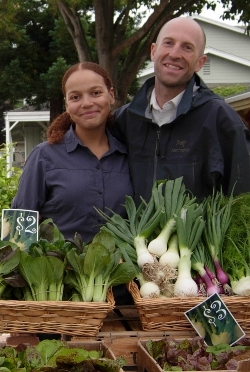 At the heart of Community Supported Agriculture in San Francisco are local farmers Paul Hamilton and Aurora Wilson of Greenhearts Family Farm. Their mission is to share a bountiful harvest with a community of supporters who value real food, the environment, health and eco-positive, sustainable agriculture. A farmer since age 14, Grant Brians started farming organically in 1975 and is the only original California Certified Organic Farmers member remaining. In early 2006 Grant acquired Heirloom from founder Stuart Dickson. Heirloom Organics uses a combination of organic and Biodynamic practices to grow an assortment of vegetables and herbs. Grant is committed to flavor, freshness, organics, and genetic preservation. Each year, Heirloom grows over 100 varieties of vegetables, herbs and fruit. Lisa Knutson is an exemplary farmer raising happy chickens, lambs and goats on her Hollister, Ca farm. Pasture raised eggs and meats are healthier and taste better, and a farmer like Lisa makes them even a little bit more special with her great care and compassion. Every carton of Lisas handwashed, hand packed eggs contains a beautiful rainbow of brown, blue, white and green shells. Phil and Katherine Foster farm 250 acres of C.C.O.F. and I.F.O.A.M. certified organic vegetables, melons and fruit on two ranches near San Juan Bautista and Hollister, California. On their 50 acres in San Juan Bautista, they grow cool season crops such as lettuce and cabbage, and on 200 acres near Hollister grow hot season crops such as sweet corn, bell peppers, garlic and onions. A pioneering organic farmer in the Bay Area, Phil sets the bar for sustainable practice with his use of solar energy, bio-fuels, compost and fair labor. Located in beautiful Pleasants Valley of Solano County, California, La Ferme Soleil takes advantage of a perfect climate and soil conditions for the growing of olives for olive oil. The Milner Family is proud to be part of an ongoing traditon of California olive oil production, adding our product to a growing California collection of great tasting oils.